in Social Media with tags #TakeTheThrone, comic-con, Game of Thrones, HBO, Iron Throne Both comments and trackbacks are closed. By Audri Nakamura, Account Supervisor and Caroline Tseng, Senior Strategist at 360i. HBO premiered Season 4 of “Game of Thrones” on April 6 with an episode that marked the most social HBO original series debut ever, breaking the record held by Season 3’s “Red Wedding” episode by more than 18 percent. Per Nielsen’s Social Guide, 6 million people saw a tweet in reference to “Game of Thrones” for the premiere, and there were more than ten “Game of Thrones” related hashtags trending on Twitter worldwide. On Facebook, the show saw 2.8 million interactions. Since the premiere, HBO has promoted the hashtag #TakeTheThrone as part of an integrated effort to continue building excitement around the show that has included a 60-hour marathon of the show’s first three seasons, live social conversation, influencer and celebrity engagement and the re-launch of the “Game of Thrones” Viewer’s Guide. Following some game-changing events in last week’s episode, HBO and 360i are building on the wave of conversation by finally giving fans their chance to stake a claim to the most sought-after seat in Westeros: The Throne. By using the hashtag #TakeTheThrone on Twitter, Facebook and/or Instagram, fans can enter for the chance to win a trip to San Diego this July to sit on the real Iron Throne at Comic-Con. In addition, HBO is collecting fans’ #TakeTheThrone posts and building them into a completely fan-built, digital throne made solely out of the letters of words from fans’ sacrificed social claims, much like the 1,000 surrendered swords of the real Iron Throne. The experience comes to life as a 3D interactive model that can be explored to reveal contributing fans’ #TakeTheThrone claims, photos and content in 3D. 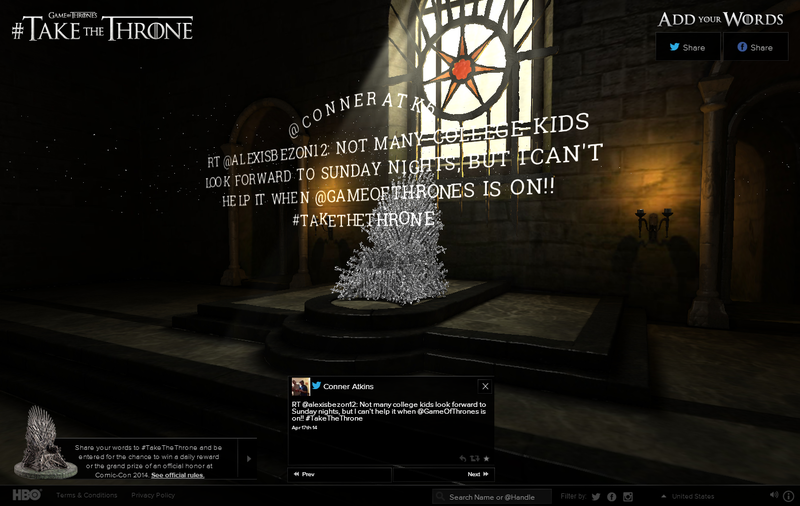 Stake your claim using the hashtag #TakeTheThrone and watch your words be built into to the digital Iron Throne at www.takethethrone.com. HBO and 360i’s recent effort builds off of previous initiatives leading up to the season premiere of the show. Prior to this season, HBO launched #ROASTJOFFREY, the first-ever social media roast dedicated to the most hated character on the Internet. Last month, HBO rolled out an illustrated content series called “Beautiful Death” to count down to the new season, and will continue to build on the series in Season 4.